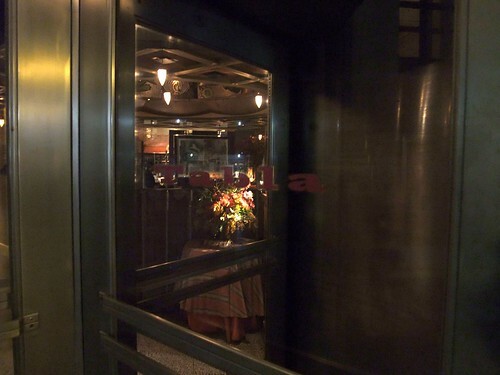 Tabla was one of the first high-end restaurants I ever remember wanting to eat at. It opened around the time I was finishing up high school, you do the math, and somewhere between it being Indian-fare-"if I'm going to try Indian, I want it to be good,"-and it not being the stuffy Eleven Madison Park, I decided it would be on my list. But then I forgot about it. Every now and then I would be reminded of what my dinner there would be like, but I always figured it would be around, and one day I'd have "fancy date night" there and that would be that. Then word came out that it was closing. 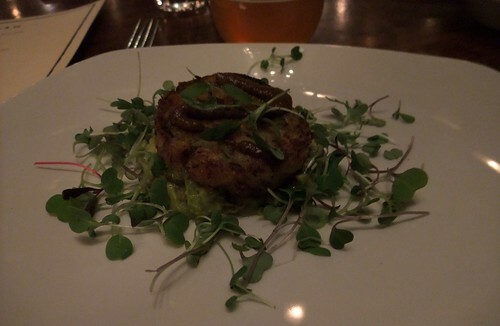 When a good friend approached about going to the Brooklyn Brewery's farewell dinner there, I chomped at the bit. The dinner was prix-fixe down to the beer we were going to be drinking. I didn't have a problem with this because I would have an incredibly hard time picking out one entree, and there's also my preference of drinking beer with my dinners. 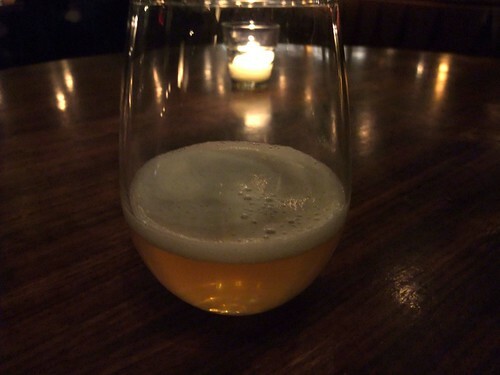 To start, we received some Sorachi Ale, and Tabla's celebrated naan. 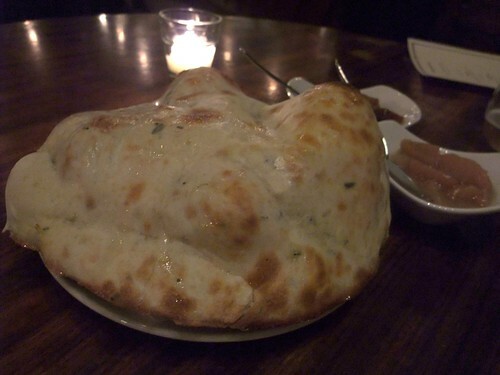 I've never seen such airy naan, and it was the best I've ever tasted. 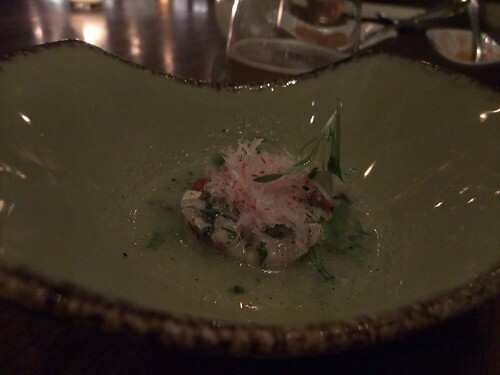 First course was Hamachi Tartare with Cuvee de Cardoz. Apparently, Brooklyn Brewery thought that all their 2009 cases of Cuvee de Cardoz had been drunk, until they found the last one. Our drinks were from that case. The hamachi was, in my amateur opinion, superb; it tasted like the sea and the complementing ginger and mint added a nice kick I would have never thought of. Next up, the famous Crab Cake. I had heard it was one of the best things on the menu, and true to the rumors, it was pretty freaking awesome. The crab taste isn't overpowered by the breading (panko,) spices, or accompanying guacamole. Turns out this is one of Garrett Oliver's favorite dishes there as well. For it, he chose to pair the dish with Blast, a double IPA. 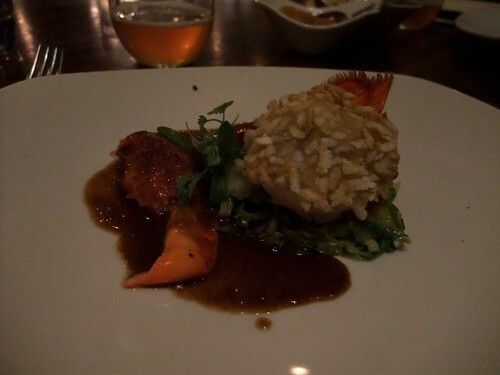 Third course ended up being another seafood dish: Rice Flaked Lobster paired with the Brooklyner-Schnieder "Hopfen-Weisse" Weizenbock. This was the most unique presentation of lobster, the rice made it a bit crunchy and a side of excellently cooked brussels sprouts bringing up the seasonal aspect. Of course, the lobster was incredible, meaty and fresh. It made me almost consider liking cooked, not in a roll, lobster. The main entree, if you can call it that, was Sweet Spice Braised Oxtails atop a Tapioca Pilaf, Peanuts, and Pea Tendrils. 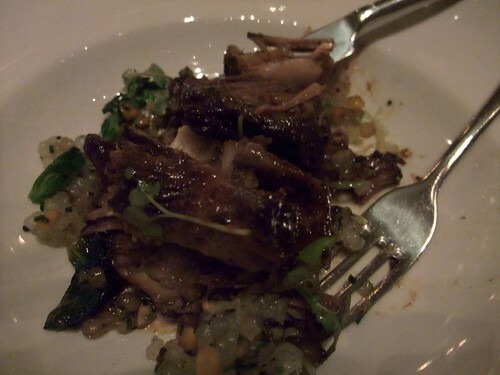 The oxtail was "fall off the bone" tender and meaty, complemented by the sweet sauce slathered on top. I even started considering eating the bone marrow-something I still have issues doing. This was paired with Cookie Jar Porter, a dark, sweet, oaty porter. 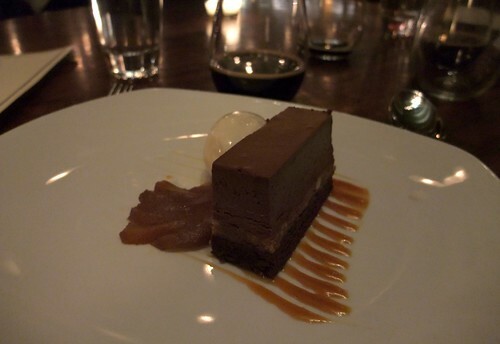 For dessert, we received the Tibetan Tiger Tea-Chocolate Pavé with Seckel Pears and Milk Sorbet and some Black Ops, a Russian Imperial Stout, to drink. The rich and very decent pavé is sitting on a caramel swirl that tasted delicious when mixed in with the cake. Though my dinner companion didn't care for the sorbet, our first disagreement of the night, I thought it was creamy and perfect for the pears. Of the dishes here, it's probably the only one I could ever recreate at home. All in all, it was a fabulous dinner and will most likely be the only time I ever get to eat at Tabla. If you should find an offer to eat there before it closed on December 30th, you shouldn't take the time to think twice. In a way. While I'm pretty certain that most Indians don't eat cow, I believe that seafood does make an appearance on most coastal menus. Chef Cardoz is from Goa, which is heavily influenced by the sea and their Portuguese colony days. It was more Indian fusion, mixing Indian and American food. It does make me wonder what high-end Indian food, in India, is like.